Grau Gourmet Grain-Free is a top quality complete food. Some cats are sensitive to the addition of grains or cereals to their diet. Grau Gourmet Grain-Free takes into account nutritional sensitivities. Grau Gourmet Grain-Free exclusively contains meat, no carbohydrate. Carefully selected meats are gently prepared create a delectable, highly digestible cat food. The specified meat variety is from 50% muscle meat and 50% innards. Only quality innards with a high nutritional value are used, such as heart, liver, stomach and tripe (depending on the type of meat). Both raw ingredients and production of Grau Gourmet Grain-Free are entirely free from artificial preservatives, antioxidants, attractants, colourants and flavourings. Grau guarantees that Grau Gourmet cat food is free of soya modified protein content. It comes sealed in an air-tight container and thus is protected from spoiling. This quality and tasty cat food undergoes a stringent quality control proceΒ. 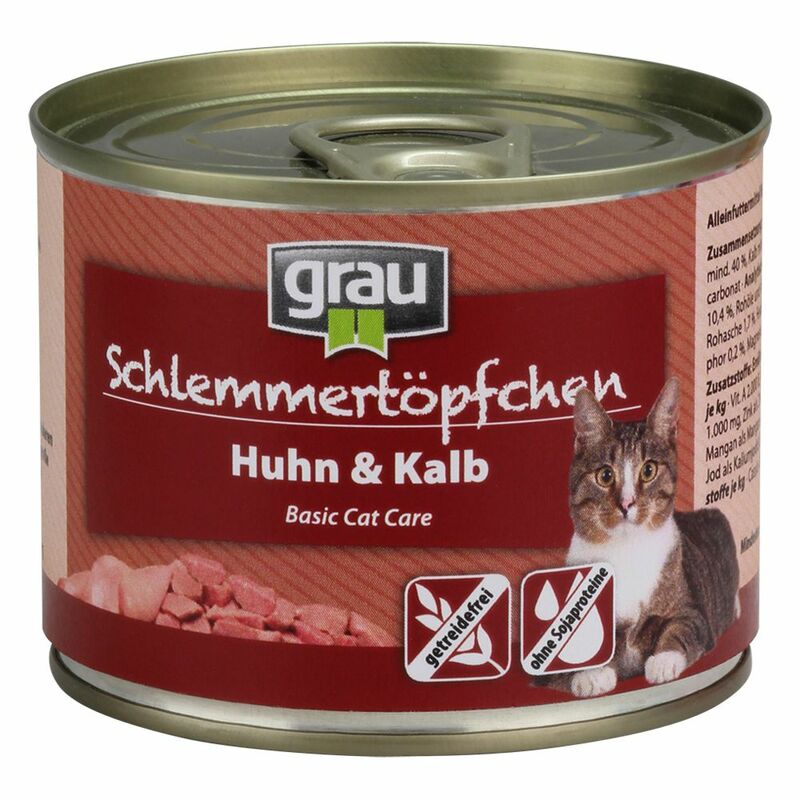 Grau Gourmet in 200g portion cans is ideal for owners of more than one cat, or especially hungry cats. Grain-free Meat from 50% muscle meat and 50% innards Innards from heart, liver, stomach and tripe Only specified source of meat in each variety Suitable for nutritionally sensitive cats No soya, no artificial ingredients Careful, gentle preparation Handy can size of 200g.